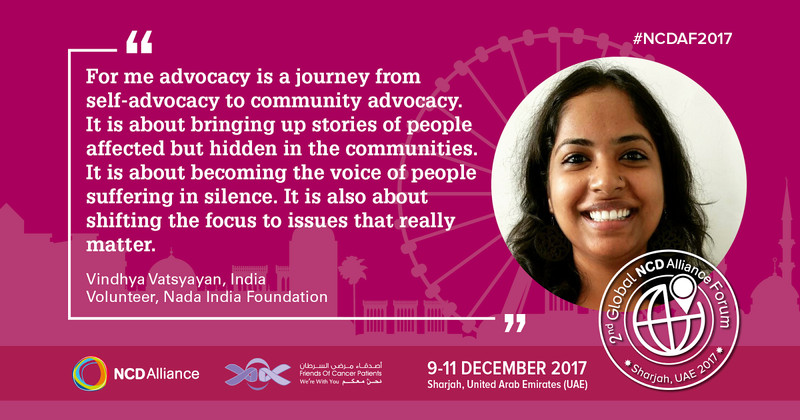 On December 7-11, Nada India’s youth advocate Vindhya was at the pre forum youth workshop and the second Global NCD Alliance Forum in Sharjah, United Arab Emirates! 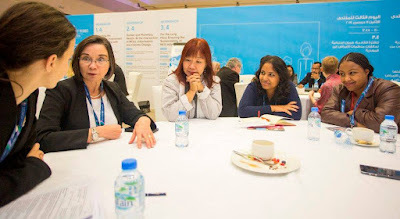 The second Global NCD Alliance Forum was organized by the NCD Alliance (NCDA) in partnership with local host organization, Friends of Cancer Patients (FoCP). 350 members of the NCD movement from 68 countries attended the Forum from 9 – 11 December in Sharjah, United Arab Emirates. This year, an increased number of youth delegates and people living with NCDs participated in this unique event, which reflected the Forum’s objective to promote the engagement of the next generation and people living with NCDs as central parts of the NCD movement. 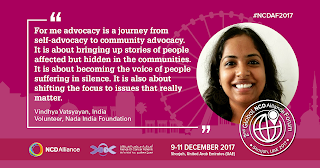 Vindhya was among the 22 youth delegates who called on their peers, CSO and government to step up the pace on NCDs. The enthusiasm and engagement of 22 youth delegates was reflected in the Youth Call to Action produced at the Forum, as a time-bound and measurable agenda for the next generation in the lead up to the 2018 UN High-Level Meeting on NCDs. The focus was on how to engage the right people at the right time; i.e. mapping the key stakeholders, setting up the priorities and the importance and impact of these key priorities. The youth advocates were exposed to some excellent examples of successful stakeholder engagement and how it made an impact at local, national and global levels. The key stakeholders identified by the youth advocates involved The Ministry of health, finance, social justice, youth, PLWNCDs, caregivers, WHO, private sector, pharmaceutical companies, Hospitals, NGOs...the list is endless but the one who can influence and is interested will lead. And what are the priorities for NCDs? Finance, awareness, access to health care, risk factors and youth behavior, prevention, youth participation, PLWNCDs and the commercial determinants of health. The participation of youth and people living with NCDs is extremely important at all levels; we learnt how to develop a comprehensive agenda for young advocates using an integrated and inclusive approach keeping in mind that we need room for all, health for all. · To mobilize youth in NCD response. · To promote the engagement and meaning involvement of people living with NCDs. · To mobilize and strengthen the civil society on my country. · Throughout the development of the health related frameworks, young people should be at the forefront in advocating for priorities to improve health and wellbeing. · Youth voices can put pressure on decision-makers to recognize and include issues that are often side lined, particularly related to alcohol and substance abuse. · Young people can develop grassroots campaigns on the prevention and management of alcoholism and should advocate for policy-level changes. · Many of these young people are researchers helping to generate evidence being used to support these changes. · As young people, they bring unique experiences and perspectives to health agendas and have a right to negotiate the future health of the communities in which we live. · Ahead of next year’s high level meeting, advocates must ensure that the priorities of young people are heard and acted upon at every level and that governments are held accountable to their health commitments. · Ensure universal and equitable access to high-quality, affordable, age-appropriate health care. · Scale up financing and resources for prevention, management, and treatment of NCDs across the life-course. · Raise awareness of children, adolescents, and young people, and sensitize government officials about the risk factors, prevalence, and impact of alcohol as one of the major risk factors. · Advocacy for the prevention and control of alcoholism and drug abuse needs substantial input from youth as drivers of the next generation of innovative solutions and action for health. · Deliver youth-generated messages on awareness and advocacy priorities via social media, blogs, and other communication channels. · Measuring progress is essential to ensuring these steps achieve their intended results. We commit to monitoring delivery against these actions, as well as celebrating and learning from successes, and identifying further opportunities to sustain momentum towards next year’s meeting.